For 30 plus years we have been offering the service of re-silvering headlight, taillight and cowl light reflectors back to factory specifications. Silver plating was originally the most effective way of plating reflectors and is still used here today at Steve’s to achieve the superior reflective capabilities versus using chrome or other materials. Most original reflectors were made of brass. To determine if your reflectors are brass use a magnet, if it won’t stick it is brass and in some very rare cases even aluminum. If the magnet sticks it is steel. To re-silver brass reflectors we chemically clean, polish, silver plate and then finish polish them. Steel reflectors are often rusted and require bead blasting. Steel reflectors usually cost more to re-silver because they are copper plated before being silvered to achieve proper adhesion and reflective capabilities and to fill rust pitting. Some light pitting can be silvered over, but the pits will often still be visible. Pitted steel reflectors are copper plated and then hand sanded to remove the pits which adds to the cost of processing steel reflectors. 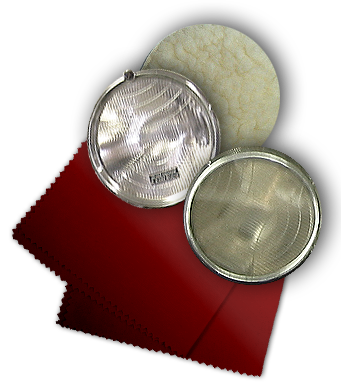 Reflectors that have dents, old gasket material and heavy coatings will take extra labor to prepare for re-silvering. We also offer disassembly and reassembly. The shop rate for these services is $80.00/hr.Turn around time is approximately 4-6 weeks from the time we receive the reflectors. Rush orders can be processed within 3 weeks but we cannot guarantee that service. There is a 25% additional charge for this service. Please remove lenses, sockets, bulbs and gasket materials before sending in your reflectors. If you have European lights needing resilvering and the lenses are crimped into the reflectors, we can remove and replace them at an extra charge. Include your name, address, telephone number, and any specific instructions regarding your order (I.e. shipping, payment, contact person, additional product or services needed to process your order). We also have a wide selection of rare original headlight lenses, bulbs (6 or 12 volt) and cork gaskets in stock. We can also install a 12 volt halogen conversion or supply you with the kit. Please ask for availability and pricing.To determine the cost for resilvering measure the diameter across the face outer edge to outer edge. Find your measurement on the chart below. Prices are listed for EACH reflector to be re-silvered. The prices below are for undamaged, clean brass reflectors ONLY! Steel reflectors are priced on an individual basis which takes into account condition and size and are always higher priced than the brass reflectors. Most steel reflectors will have rust issues which leaves pits in the reflector that have to be plated and sanded and polished to remove them before the application of the silver plating.